Although in last month’s jobs report we saw a fall in the unemployment rate accompanied by a drop in labor force participation—which showed the unemployment rate dropping for the wrong reasons—the longer-term trends suggest that displaced workers continue to return to the labor market. This is to be expected as the labor market improves, and what we’ve been expecting for years. The unemployment rate of 3.9 percent seems to be overstating the strength of the labor market given how many sidelined workers appear to want jobs. Furthermore, upwards of 70 percent of the newly employed are coming from out of the labor force as opposed to those “actively” looking for work, that is, among those officially counted in the U3 unemployment rate. We only need to look as far as nominal wage growth to know that we are not yet unambiguously at full employment. Employers and workers alike seem to recognize the slack out there and workers still do not have sufficient leverage to bid up their wages. Year-over-year nominal wage growth has averaged 2.6 percent over the last couple of years, consistently below target levels. Unfortunately, nominal wage growth for private-sector workers found in the monthly jobs report’s payroll survey offers only a limited view on wage growth in the economy today. One of the major benefits of a full employment economy is that wage growth isn’t simply strong for workers at the top of the wage distribution or for workers with more educational attainment, but that it allows low-wage workers to make gains as well. To get finer-grained estimates of what’s happening to wage growth for particular groups of workers, we have to turn to the Current Population Survey Outgoing Rotation Group (ORG). The ORG is a household-based survey, not an employer-based one like the payroll survey, which each month provides widely reported estimates of job growth and wage growth for private-sector workers. This is important because this means the ORG can not only ask questions of wages, but also make comparisons of wages across the wage distribution. Adding to that information gleaned from the Current Population Survey Annual Social and Economic Supplement (CPS ASEC) allows for comparisons about incomes, notably information on poverty rates. Over the last couple of weeks, EPI has been highlighting some important statistics in commemoration of the 50th anniversary of the Poor People’s Campaign. We’ve pointed out the changes in the poverty rate over the last 50 years, where gains have been made, particularly among the elderly, and where disparities remain. We also discussed how poverty reduction can be improved with a stronger safety net and a better labor market. The truth is that full employment that makes more hours available to lower-wage workers and broad-based wage growth are key tools in the fight against poverty, and many people who live below the poverty line rely on a stronger economy to make ends meet. Given that many poor people work and that labor earnings account for an increasing share of income for families in the bottom fifth of the income distribution, it’s no surprise that wages at the bottom and the poverty rate are inversely related. 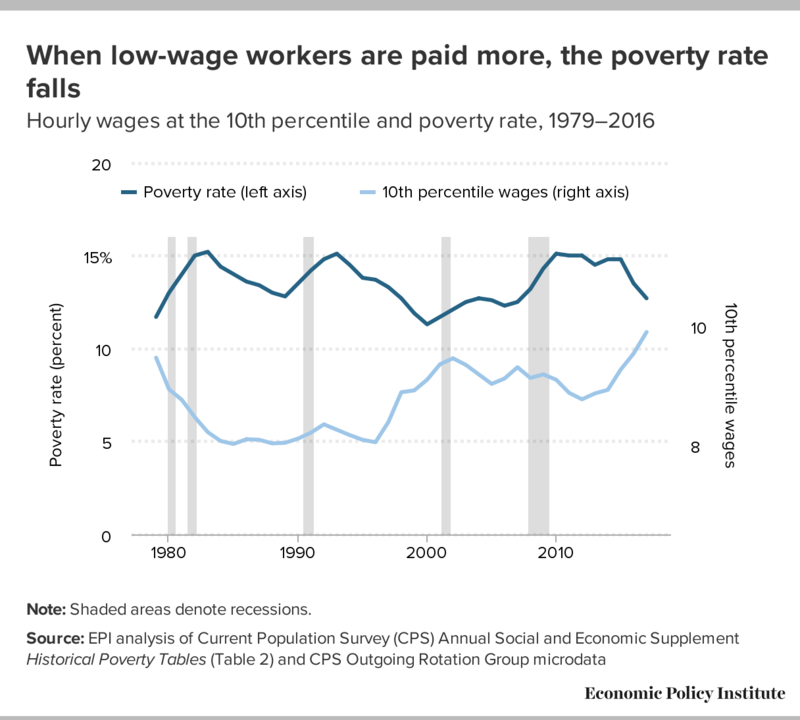 The figure below shows wages at the 10th percentile (i.e., the worker who earns more than only 10 percent of workers) from 1979 to 2016, compared with the share of people in poverty over the same time period. Over the majority of this period, as 10th percentile wages increased, poverty decreased, and as wages fell, the poverty rate rose. It is clear that high-pressure labor markets where unemployment remains very low for a long time contribute greatly to living standards growth for low and moderate-income families. When we’ve seen more hours available and stronger wage growth as in the high-pressure labor markets of the late 1990s, we’ve also seem large reductions in poverty. The Great Recession led to a sharp increase in the poverty rate, which has just recently begun to fall as the labor market has tightened, with the corresponding rise in the 10th percentile wage. In this period of commemoration of the Poor People’s Campaign, it’s important to note that enough jobs as well as jobs with enough hours and high enough wages can take people out of poverty. On Friday, we should continue to look for stronger wage growth as a sign of a tightening economy, where workers continue to come in off the sidelines and eventually see that lessened slack translate into better bargaining power to bid up their wages.